This modern Thai villa sits in the beautiful Santi Thani Estate with superb views over Bangpo beach which stretch far out across the bay to the nearby island of Koh Phangan. 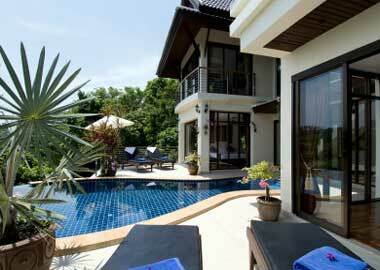 The aptly named, beautiful Villa Kao-lom, translates into mountain breeze. 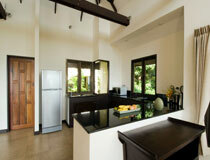 Villa Kao-Lom is a three bedroom villa, sleeping a maximum of five. The two double bedrooms open out onto the very private pool deck. The pool deck is complete with a beautiful 25sqm, free form, infinity pool with integral tiled seat Jacuzzi. 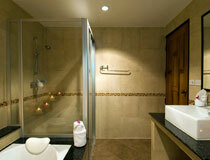 On the pool level there is a third single bedroom and wonderfully appointed guest bathroom. The master bedroom comes equipped with dressing room and en-suit bathroom, complete with walk in shower and striking bath. The pool deck, while not being overlooked in any direction, enjoys views of the sea to the front and the coconut palms to the left and right. A truly magical setting for peace and relaxation. The living areas and bedrooms are all fully air conditioned and the house is beautifully furnished with contemporary Thai furniture. 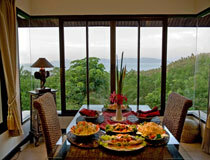 The outside areas are equipped with sunloungers and comfortable dinning furniture. The bathrooms come with ample amounts of hot and cold water complete with the all important luxury bath towels to make your stay as perfect as possible. Villa Kao-Lom truly is paradise. Santi Thani is a tranquil development set in the foothills of Ban Thai, Villa Kao-Lom is 3 minutes from bangpor beach.The beach is dotted with local bars and restaurants and 10 minutes by car to Samui's capital Nathon and 30 minutes from the lively Chewang and Samui Airport.